Learn how to interpret your results sheets and gain insights into your health and fitness. The following interpretations will help you understand the outputs on your Body Composition Results Sheet. These results can be one of the most powerful tools to help you gain huge insights about your body fat, muscle, water, metabolism, health and fitness levels. Click on any heading to learn how to interpret your results sheet data. The first section, Body Composition Analysis provides a whole –body snapshot of your Water, Dry Lean Mass, Lean body Mass and Body Fat Mass. Starting from the top, you have Intracellular Water and Extracellular Water. Intracellular Water is the amount of body water held within the body’s cells; Extracellular Water is the water outside the cells. Added together, these make up Total Body Water. After ICW and ECW you find the Dry Lean Mass (DLM). This is the weight of the protein and mineral content in the body. Below DLM is Body Fat Mass. This reports all of your body fat, including both the surface level (subcutaneous) and internal (visceral) fat. By adding ICW, ECW, and DLM together, you get the total Lean Body Mass (LBM), which is the weight of everything in the body that is not body fat. This includes muscle, water, bones, organs, etc. – everything that is not Body Fat. The Muscle-Fat Analysis section provides a snapshot of three very important metrics. Weight: is the total body weight. Skeletal Muscle Mass: (The total weight of your Skeletal Muscle). These are the muscles that can be grown and developed through exercise and weight training. Body Fat Mass: This is how much body fat mass you have, and combines both the surface level and internal fat. The 100% mark, as well as all the percentage marks, are all based on what would be considered normal for an individual at their specific height when tested. The arrows above the results shows how you compare to others of the same height and gender. While the healthy range varies, 100% designates the average for individuals with the same height and gender. So, if the weight bar extended to 130%, this means you are 30% above average. Similarly, if your weight bar extended to only 70%, this means you have 30% less mass than is considered normal for your height. 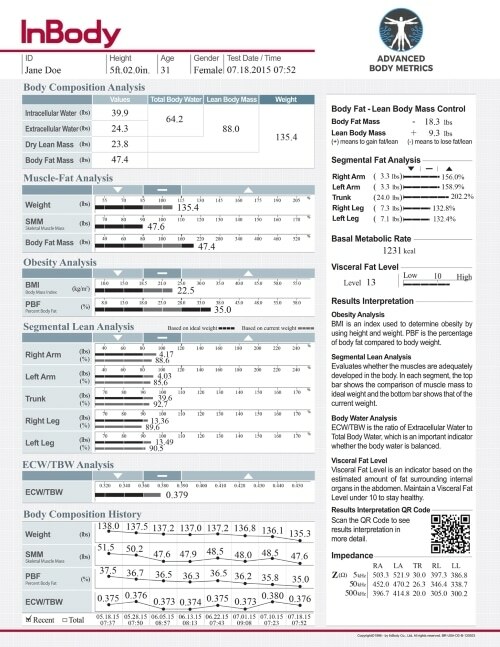 The Obesity Analysis section includes one of the most important metrics of any body composition analysis: Percent Body Fat (PBF). It’s a fairly simple metric, division of body fat mass by total weight (*PBF = Fat (lb) / Weight (lb) x 100). However, it is much more informative and better indicator of the risk of obesity than BMI, which is one of the major reasons BMI is still included in the analysis – to highlight its limitations by comparing it to PBF. For PBF, the ranges differ between men and women. Women tend to carry more body fat than men due to their reproductive system as well as genetics. A graph that represents a female individual should fall in the normal ranges between 18-28%, with the average being 23%. For men, the healthy range is between 10-20%, with an average being 15%. In the Segmental Lean Analysis section, the body into 5 body segments: the two arms, two legs, and the trunk, which can be thought of as covering the area between the neck and legs. There are two bar graphs for each body part in the Segmental Lean Analysis graph. The display of the two bar graphs provides an assessment of your current lean mass distribution. The numbers beside the upper bar graph indicates your lean mass weight in the designated segment. If the length of the upper bar graph reaches 100%, it indicates you are at the ideal lean mass for that segment, based on your ideal weight. The length of the upper bar graph shows the relative ratio of the ideal lean mass based on his or her ideal weight. Segmental Lean Analysis compares the pounds of Lean Body Mass against the average expected amount of Lean Body Mass for that person’s height. If the lower bar graph reaches 100%, it indicates you are at the ideal lean mass in relation to your current weight. Therefore, the length of the lower bar graph indicates the relative ratio of the ideal lean mass for their current weight, while the number beside the lower bar graph shows that ratio. This shows whether or not you have enough Lean Body Mass to support your own body weight, where 100% is sufficient. Segmental Lean Analysis provides you with the ability to observe your upper/lower lean balance, left/right lean balance, and lean body mass distribution, segmentally. This allows for close monitoring of the distribution of lean body mass to help determine if the distribution of lean mass is adequate or if changes need to be made. ECW/TBW Analysis section looks at the ratio of Extracellular Water. Total Body Water is composed of Intracellular Water and Extracellular Water. Extracellular Water (ECW) is the plasma water, interstitial water, transcellular water, and water found in bone, cartilage, and dense connective tissues. Intracellular Water (ICW) is the water found in the cytosol of every cell in the body. In healthy individuals, intracellular fluid takes up roughly 62% of the body water, extracellular fluid takes up roughly 38% of the body water. A healthy individual is expected to have a ratio of ICW to ECW is 3 to 2, which is 0.38 when calculated as ECW/TBW. Most healthy people will have an average ratio of around 0.380, with the acceptable range being between 0.360 – 0.390. The Body Fat & Lean Body Mass Control section makes it easy to set goals. It can help you reach your ideal body composition, which is defined as the average PBF for their gender (15% for men, 23% for women). For those on an active dietary-exercise modification programs or routine, it allows you to make adjustments to the lean body mass-fat mass ratio rather than simply increasing or decreasing his/her weight. It also explains how you should adjust your weight, especially by gaining or losing muscle or fat. Depending on your current body composition, this section will recommend adjusting Body Fat Mass and/or LBM in order to reach the target PBF. Segmental Fat Analysis is a derivative of the segmental lean analysis and is presented as a segmental breakdown, similar to the segmental lean analysis. This portion of the result sheet provides both the weight value, as well as a percentage value. The segmental fat analysis evaluates where fat is adequately distributed throughout the body, based your ideal body weight and height. Each bar shows fat mass in comparison to the ideal. In the above example, the person above has 3.3 pounds of body fat in their left arm. For a person of their height and gender, that’s 158.9%, or 58.9% more body fat than the average person with the same height and gender. The Basal Metabolic Rate, or BMR, is the number of calories you require to maintain your basic, life-sustaining functions. Your BMR does not take into account any calories needed to perform daily activities. Additional exercise and daily routines require additional calories to match your daily caloric needs. This number changes as your muscle mass changes. In general, if you want to lose fat, you need to run a caloric deficit. The Visceral Fat Level is an indicator based on the amount of fat surrounding the surrounding your major organs. Visceral fat is associated with the risk of developing certain health diseases. An accumulation of visceral fat can contribute to an increased risk of diseases such as Diabetes, Heart Disease andStroke. In order to minimize health risks associated with excess visceral fat, you should maintain a Visceral Fat Level under 10. Research has found that engaging in more cardiovascular exercise can improve your health by reducing visceral fat.